longitudinal fibers are positioned around the circumference and provide stabilization of the circular fibers during contraction. Coordination of motility and other routine activities is accomplished by a complex of nerves, known as the intramural plexus, located within and between each layer. Autonomic and central nervous system inputs occur as necessary to maintain synchrony with the body at large. Gastric digestion alters food to improve its overall compatibility with water, to enhance the subsequent rate of enzyme action and nutrient recovery by the small intestine. 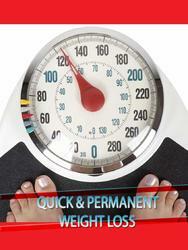 Consumed food is initially stored, and then gastric juice is added and mixed into the mass for enzyme modification. 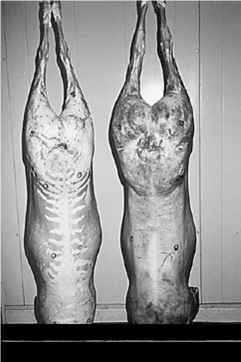 Food storage occurs at the end of the esophagus and/or in the cardiac area of the mammal's stomach. The crop is an outpocketing midway down the fowl esophagus that provides storage. 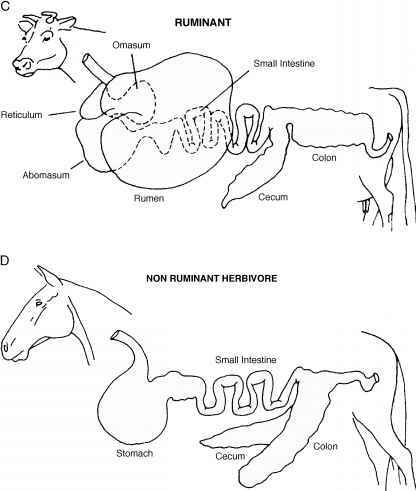 Ruminants have a specialized esophageal area compartmentalized into rumen, reticulum, and omasum. Bacteria and protozoa anerobically ferment feed in the rumen to greatly expand their numbers while producing by-product volatile fatty acids (VFAs). Additional microbial mass provides protein and vitamins for eventual recovery in the small intestine, whereas VFAs are largely removed prior to and during gastric digestion. The reticulum acts to move swallowed food into the rumen for microbial action as well as to remove spent contents for entry into the omasum. Passage between the omasal leaves acts to decrease liquid and particulate size before access to the abomasum, or ''true'' stomach. Gastric juice is a composite of hydrochloric acid and pepsin. Production and release occur in the gastric gland or fundic area of simple-stomached mammals, in the abomasum of ruminants, and in the proventriculus of fowl. Motility progressively conveys lumen contents from storage past gastric glands and then facilitates mixing for enzyme action in the antrum of the stomach and abomasum. Peristalsis also conveys food from the fowl's crop for a brief stop in the proventriculus to acquire gastric juice before subsequent mixing in the gizzard. Circular muscle associated with the gizzard is emphasized to support intense contractions for grinding, while a tough koilin mucosa endures digestive and physical stresses. The small intestine is divided into duodenum, jejunum, and ileum, in that order from the end of gastric digestion through to entry into the large intestine. Proportions of small, relative to large, intestine vary extensively with simple-stomached mammals; carnivores have the most and nonruminant herbivores the least. Mammals release an array of enzymes from the pancreas together with bile from the gall bladder at the beginning of the duodenum, while accompanying bicarbonate acts to neutralize contents and initiate digestion. Slow peristalsis of the composite is interdispersed by segmentation through the duodenum. Nutrient digestion then gathers momentum, and rapid absorption occurs through the jejunum before diminishing along the ileum. In fowl, pancreatic enzymes and bile enter at the distal end of the duodenum, and then peristaltic refluxing back and forth along its length mixes the contents to initiate digestion before continuing though the jejunum and ileum in the same to-and-fro manner. Convection of lumen contents by motility is complemented by a mucosa having villi to expand the contact area. 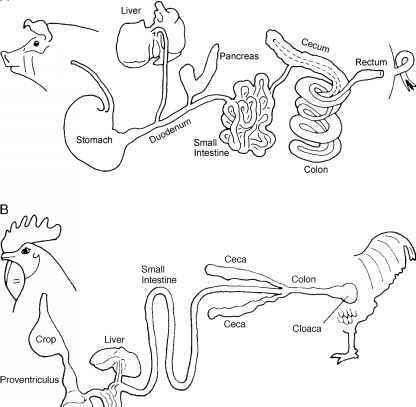 Mucosal anatomy is remarkably similar among animals. Muscle fibers extending from the base into each villus also foster movement to enhance surface exchange. Enterocytes on each villus arise from their mitotic origin at the base, known as the crypt of Lieberkuhn, and become competent at digestion and absorption once beyond midpoint. Microvilli located on the surface of mature enterocytes are coated wih mucus from adjacent goblet cells to create an unstirred water layer that is stabilized by a fibrous glycocalyx projecting from their ends. Enzymes immobilized on microvilli encounter digestion products diffusing into the unstirred water layer. Resulting products are immediately capable of absortion and are then transferred through the basolateral membrane to an underlying vascular system, for rapid removal and maintainance of a concentration gradient. In mammals, lymphatics convey absorbed fat as chlomicrons from the mucosa, whereas fowl form very low density lipoproteins that enter the portal system. Distinct lymphatic vessels are absent in fowl.